It’s going to be the Party of the Year! At 6 p.m this Friday, February 10, join us for the Murder at the Four Deuces Mystery Dinner at the WCA Red Barn (64 Village Road next to the post office) in Wilmot. (Wilmot) Don Wannabe and his wife, Madam MeMe, are hosting the event of the season. 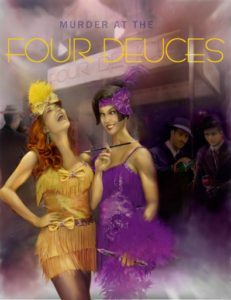 The Grand Opening of the Four Deuces speakeasy will take place Friday night. It will be an exciting night for all! An inside source has confirmed that “The Family’s” créme de la créme will attend this extravagant event. Rumor has it that New York Capo “Toto” Tequila will be in town. Will the Boss of Bosses attend the Grand Opening? Mystery and speculation abound. Don’t miss out on the fun. Channel your inner flapper and find that fedora! Costumes encouraged! There will be a sing-a-long and prizes. $20 each and BYOB for a delicious lasagna dinner and a great show. You can purchase you tickets online through our donations page. Please choose Other Amount to indicate total ($20/ticket) and note Murder Mystery Dinner and number of tickets needed in the Special Message box. Additional donations welcome! Snow date is Friday, February 17. This entry was posted in WCA, WCA Events, WCA Fundraising, WCA News, Wilmot and tagged Dinner & a Show, Fundraising Dinner, Murder at the Four Deuces, Murder Mystery Dinner by admin. Bookmark the permalink.